You are at:Home»Coil»What Causes Leaks In Air Conditioners? I just read the most complete article about what causes the majority of leaks in air conditioners. During the middle of the last decade, manufacturers tried to cut costs by reducing the wall thickness of the copper tubing used to make their air conditioning coils. The thinner walls are more susceptible to formaldehyde. Formaldehyde from the building materials and ground create formic acid which eats away at the copper. Now that there is less copper in the pipes, the faster the erosion becomes and the more prevalent the leaks have been. This article really lays out the research and the results. Alexander Heating and Air Conditioning can repair leaky systems with our Leak Seal Treatment and save thousands of dollars over alternative solutions. 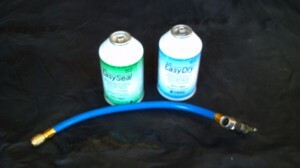 Our three part treatment stops those current leaks and prevents future leaks from appearing. Not only will our treatment seal the current leaks, but will stay active in your system to seal any future leak caused by formic acid. Besides, prices are continue to increase each year as supplies of the old R22 are being regulated out of circulation. Stop adding refrigerant every year. Get our Leak Seal Treatment and start saving money. Call today for our leak seal treatment price. My air conditioner is not working, the fan outside is not spinning, what is wrong?